Eligibility: Female students who are studying for a degree in one or more of the following: Sports Science, Sports Physiotherapy. Sports Management, Physical and Sport Education, Sport Psychology, Sports Nutrition, Sports Rehabilitation, any Sports-related degree. Eligibility: Currently enrolled student at any school or college and can get a proof of enrollment. Application: 1,000 word essay on the following topic: “Is the world really big? Moving around the world in less than one day”. 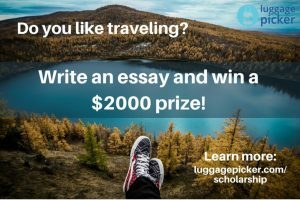 Format essay as specified on website and email to: scholarship@luggagepicker.com. Eligibility: Applicants must be currently attending or planning to attend a college or university, must be in good academic standing with educational institution. Applicants under 18 years of age must have permission from a parent or legal guardian. Eligibility: High school senior or undergraduate student pursuing a Graphic Design or Applied Arts degree. Must be legal U.S. resident and at least 18 years of age. Application: Submit a unique visual design displayed on the blank trade show display provided on their website. Applicants are encourages to think outside the box. In addition to this graphic design example, submit a short essay (200-300 words) answering the following question: “Why are you passionate about pursuing a degree in Graphic Design or Applied Arts?” Email application documents to scholarship@indydisplays.com. Include your name, age, major, and accredited university or college. Eligibility: High school senior or current undergraduate student enrolled in an accredited university. 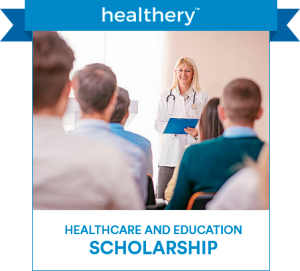 Eligibility: Student must be at least 18 years of age, studying in the U.S., minimum GPA of 2.8 or higher, currently enrolled in school majoring in a health-care or education-related field. Eligibility: College or university students who are both over the age of 18 years old and who also have a minimum GPA of 2.5 or higher. Amount: Varies per scholarship. Ranges from $3,000-$5,000. Eligibility: Three different scholarships, including awards for community college transfer students and for students with an undergrad degree in something other than accounting or business who plan to pursue a graduate degree in accounting. All applicants must maintain a GPA of at least 3.0. See website for more eligibility requirements. Amount: Three awards of $1,000 each. Eligibility: U.S. Citizens or Permanent Legal Residents of the U.S. Enrolled at an accredited college or university during the 2017-2018 academic year. Eligibility: Legal resident of U.S., enrolled full-time (12+credits), have volunteered a minimum of 20 hours between June 2017 and May 2018. Application: Submit a short essay answering the 3 questions below (500-800 word count) with a supplementary photo in the document. 1) What college/university are you attending and what is your field of study? 2) How has the subject of your photo inspired you to choose your specific field of study? 3) How do you give back to your community through volunteerism? If applicable, please also include a Statement of Financial Need.